Welcome to Rose Slots, where you can enjoy 100s of slots, outstanding bonuses, and win fab prizes every day. 65X wager requirements, £250 max bonus conversion, read more for full terms. 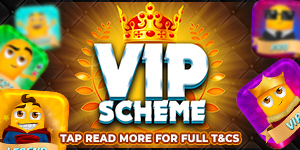 Welcome to the Rose Slots VIP Scheme where there are five exciting levels to work your way up in order to collect daily cashback and amazing rewards! Read more for full T&C's. All VIPs at Rose Slots have the chance to win a Free Pizza every week in our Exclusive Pizza Club! Play during our Happy Hours between 3-7PM every Wednesday at Rose Slots for a chance to win 500 Free Spins! 65X wager requirements, £250 max bonus conversion, read more for full terms. Win a FREE Amazon voucher when you collect 200 trophies at Rose Slots, plus win up to 20,000 FREE Spins along the way! 65X wager requirements, £250 max bonus conversion, read more for full terms. At Rose Slots, we provide over 500 real money online slots UK games for our players. All new players have the chance to win up to 500 free spins on their first deposit with us. On top of that, each time when you deposit £20 or more, you will be rewarded with a spin of the Mega Reel which could see you winning free spins on blockbuster games such as Starburst by Netent and all-time classic Fluffy Favourites Slot Game from gaming giant Eyecon. All games are available to play on laptop, tablet or mobile phone. We recommend all our players to check this promotions page regularly so you are up-to-date with all the exciting deals, bonuses and events we have created for our online slots players. Rose Slots UK is determined to provide the best online gaming experience for all slot players in the UK. We understand that time is precious so here is a quick rundown of the promotions on Rose Slots UK. Up to 20% Daily Cashback in 31 days from your First Deposit. Cashback % depends on the VIP status level. Daily Cashback up to 10% for Regular Online slots and Casino players. This is the standard cashback offer which depends on your VIP status level. £10 Amazon Voucher when you collect 200 casino trophies. Free Pizzas up for Grabs when you play on Sunday Pizzas are delivered on Mondays. We accept all of the main payment methods for deposits and withdrawals including, Visa Debit, Visa Credit Card, Maestro, Mastercard, PayPal, PaySafeCard and Pay By Mobile (Boku). All payments are processed via secure, encrypted software behind firewalls and SSL secure connections. In addition, all of our casino promotions comply with the regulations outlined by the UK Gambling Commission, so you can play safely and securely with the knowledge that all our UK online slot games are 100% fair, all our promotions are fully regulated and legitimate.